Old No. 38, New No. 6 McNichols Road, Chetpat, Chennai 600031. Also printed by Amazon in the U.K. I always rather admire cricket writers who take a subject, for example, the best-ever Tests and the finest batting performances as everyone may have a different choice and opinion on the selections. Anindya Dutta's Spell-Binding Spells therefore falls into the category of, as its name suggests, memorable bowling spells. There are many reasons why Spell-Binding Spells is an excellent book. It not only covers all formats of the game but remembers, amongst other subjects, 19th Century Tests and memorable performances by some who may not be household names. I had rather expected the author to concentrate on memorable international matches but it is very much to Anindya's credit that he enlightens readers with a variety of subjects and cricketers. 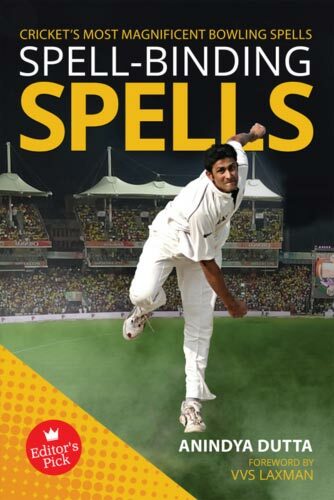 The chapters include Tests, ODIs, T20 matches but also memorable spells by cricketers whose side ultimately lost. How many times have we seen match awards given to a player on the winning side when there have been equally worthy performances on the vanquished side? The chapter on cricketers who did not represent their countries is equally illuminating. Some of these cricketers lived in the shadow of more illustrious names whilst others were denied international representation by world events beyond their control. Another fascinating chapter is the match-winning performance of those in their swansong match. Some of Anindya's chapters therefore champion the cause and bring back fine memories of some cricketers whose names may have been short-lived and not so much in the public consciousness as others. Great research has gone into this most worthy book. A scorecard for the matches mentioned accompanies each article at the end of the relevant chapter. I might have preferred to have seen it straight after the relevant article but that is only a matter of personal taste. V.V.S. Laxman, a batsman remember, has written a lovely foreword to accompany this most interesting book. Anindya Dutta is to be congratulated on Spell-Binding Spells and I would urge people to read it.